If you know us, you know we kind of like sports a little bit. We go to games, wear our favorite team apparel, have team logos on our cars, had a sport themed wedding! Yeah, we love sports. This time of year we are all about FOOTBALL!! We attended our very first pro football game this year and it was a blast, but I still love watching the game at home, where it is warm, and I can eat all the snacks I want!! Every year we have a little family party for the Big Game. This year, to make it extra special, Dave and I took on the challenge to create a Snack Stadium!! It was a fun family project and we are super proud of the outcome! Filled with our favorite SNICKERS®, Skittles®, Pepsi™, and TOSTITOS® products, our stadium is sure to be a huge hit with our friends and family! The first step in Snack Stadium construction is the PLAN! I had a great vision of our stadium, and knew I wanted a cooler in the middle and a “TV” in it as well! You will definitely want to draw out your stadium plan, maybe you can ask your family members for their ideas! I showed my plan to Dave and he had some great ideas to help make it even better! 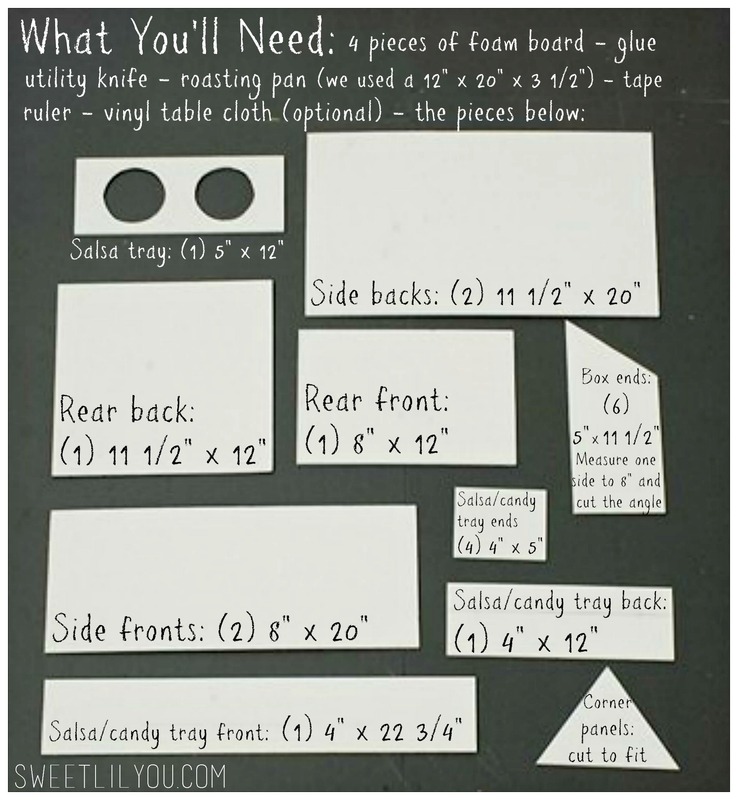 After you’ve done all your planning, and figured out the sizes, get right to work at cutting the pieces out! I am terrible at measuring (I’m a “Maybe measure once…and have to cut at least twice” kind of gal :/ Fortunately I had some great assistants!) We based our stadium measurements on using a 12″ x 20″ x 3 1/2″ roasting pan as the center. Below I have provided the “cut list” for our stadium, but yours may be different, if you’re using a different size pan in the middle. Let me also point out that this thing is pretty big! So, you want to make sure you have the space to spread out and build it AND that it fits on your table where you plan to display it. We used Dave’s shop as our build site! 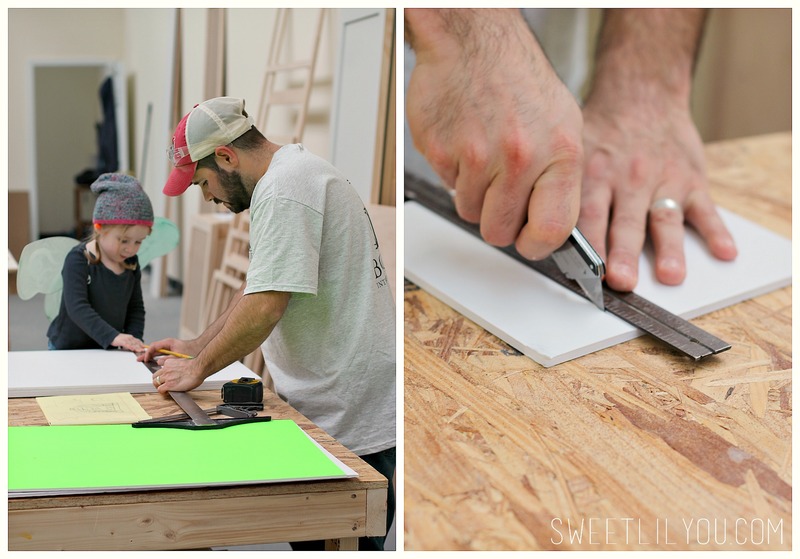 After you have all your pieces cut, it’s helpful to tape them together to make sure everything fits and you have everything you need (We used blue painter’s tape since it holds well, but comes off easily and without damaging the foam board) Once you’re sure everything is perfect, you can start gluing the pieces together! We used tacky glue, but other adhesives would work as well. After the glue was dry, I chose to tape our edges. This is optional, but since we used a sparkly foam board, I thought it looked nicer than seeing the white edge of the board. It also helps reinforce the structure. Since we can stream games through our phones, I thought it would be fun to add a cell phone holder/giant stadium screen. 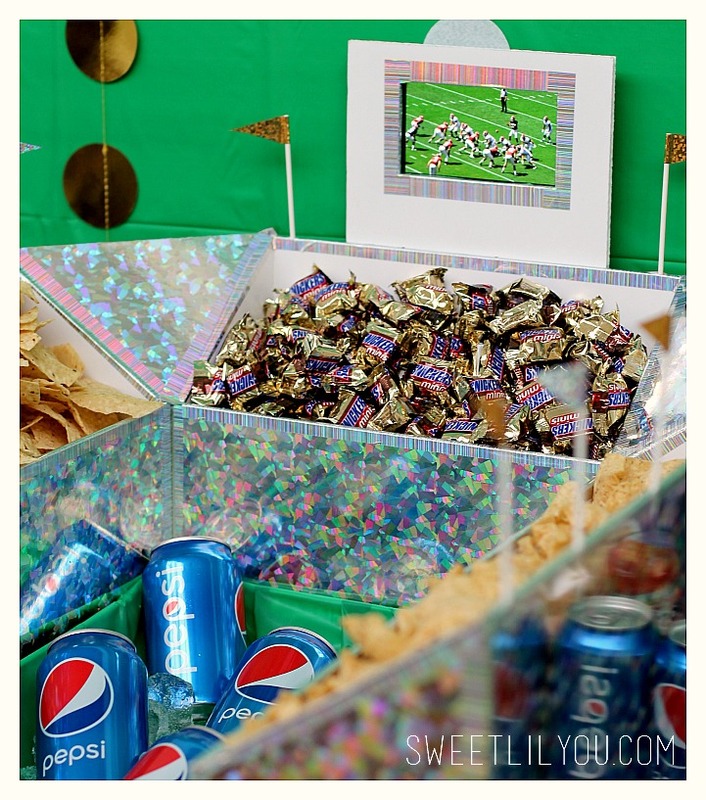 That way, our guests wouldn’t miss a play while at the snack table! I cut out a rectangle that was the size of my phone’s screen. Then stacked foam board on on the back to the depth of the phone, then added a piece that would hold the phone in place! It’s incredibly simple, ad added something extra to our stadium! Even if you can’t live stream games, there are many apps that show the game stats and info, which would be fun for this as well! In the front we had cut out circles that the TOSTITOS® Chunky Salsa fit right in! I think this Snack Stadium scores a TOUCHDOWN!! 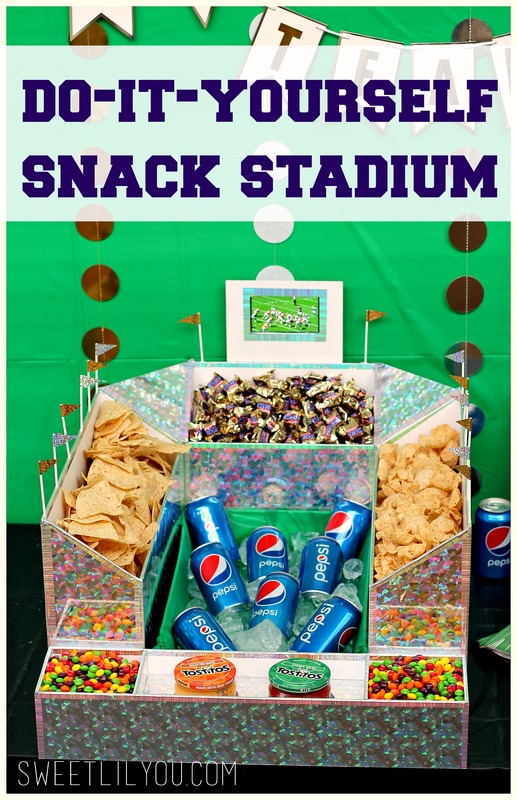 *My Snack Stadium is one of 10 finalists in a fun contest! You can help me win, and possibly win some awesome prizes for yourself! Enter below! 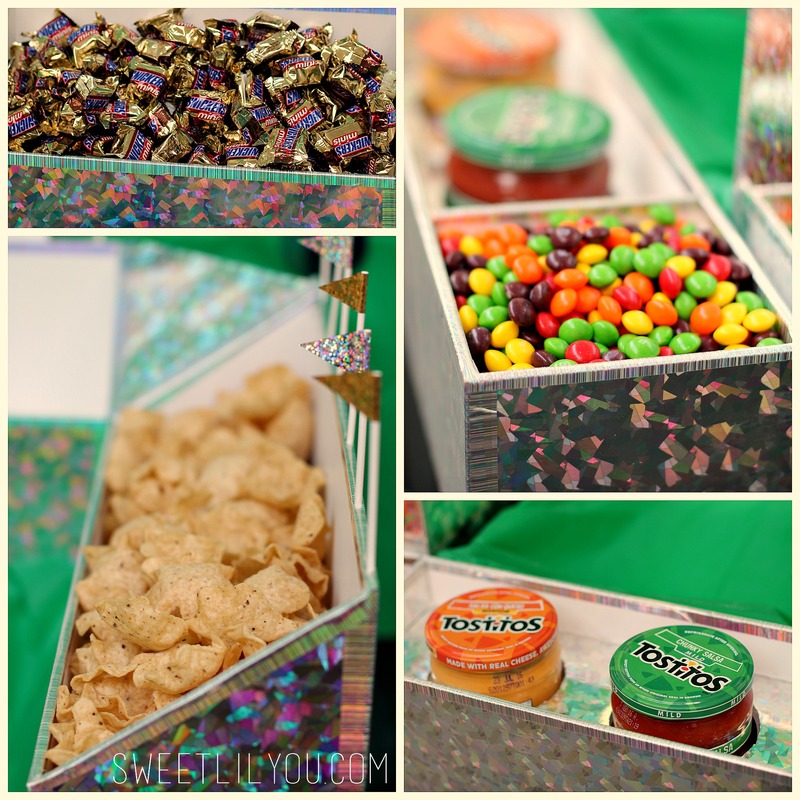 This entry was posted in DIY, parties, Uncategorized and tagged big game, DIY, party, snack stadium, snacks, sports. This is amazing, Sarah! We’re coming to your house for gameday! What an awesome display! I love the idea of adding in the cell phone holder for streaming, that is such a cute touch and definitely a memorable one! You’ve done an amazing job on this project. 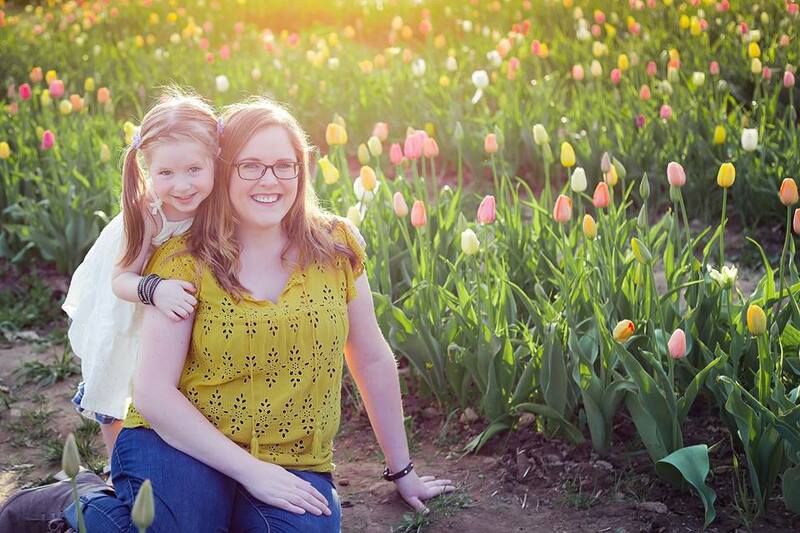 Joanna @way2gomom recently posted…2016 Erin Condren Life Planner – It’s here, it’s here! This is so fantastic. You have such great design ideas. Best stadium display i have seen. You can see how much work you put into it. Very well done. Wow, this is pretty cool! I like that there’s even an area for the drinks to sit on ice. Wow! What a great staduim. 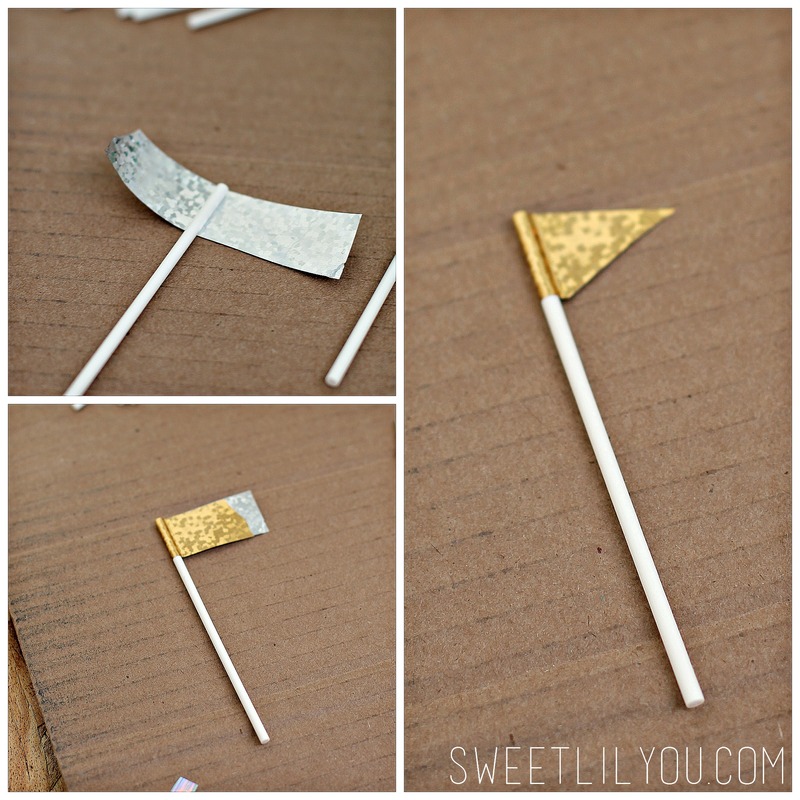 I think you should seriously sell these – great for parties! WOW! I am blown away by this. The field is the best part!! 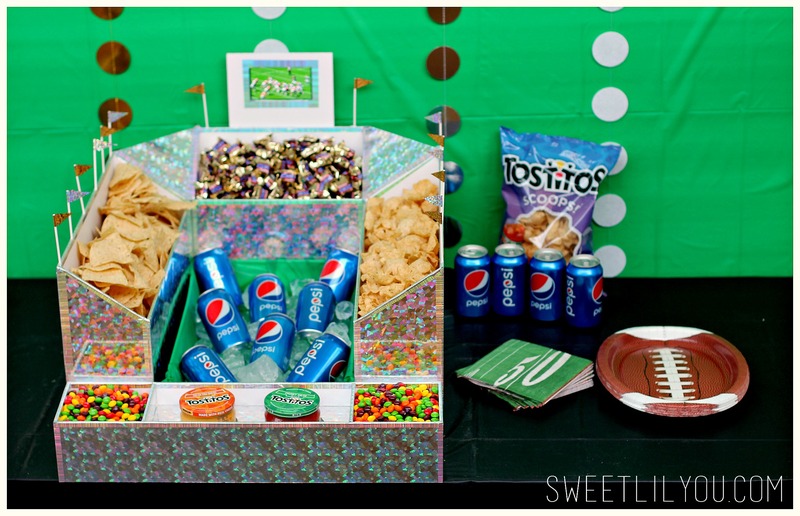 Your snack stadium is AMAZING!! I love the phone/big screen! SO smart! Rose | RoseBakes.com recently posted…5 Reasons to Get Amazon Prime for $73 Today Only! I always love the inclusion of a big screen to a Snack Stadium. Great job on this. Congratulations on being one of the top 10 influencers in the program. Wow, great work with this! I love the video board idea!! In addition, you need to find out where you can find the correct coupons. Thanks for sharing this Useful content with us. Great post and informative too. Thanks for sharing this with us.